The power button of your Android phone either wakes the screen up when you press it or turns it off when it is active. This is done to increase the battery life of the phone mostly. While there are ways to automate the process natively, for instance by configuring a screen timeout in your phone's settings, you do not get any options to automatically turn on the screen again when you want to use your phone. Plus, depending on the interval that you have selected for the power off mode, it may take a while before the screen is indeed turned off. Gravity Screen On/Off is a simple application that automates the process for you, at least partially. You can still use the power button manually to activate your phone or turn off the screen, but won't be doing it that often anymore thanks to the automation in place. Table Sensor: if you place your phone on a table or flat surface so that the screen points towards it, it will automatically turn the phone's screen off. Pocket Sensor: detects if your phone is in your pocket. If it is, will turn off the screen automatically. While that takes care of two situations where you may want your phone's screen to be turned off, it is not the only functionality that Gravity Screen On / Off adds to the table. The application has been designed to turn on the screen automatically again if you start to use it again. If you get your phone out of your pocket or switch it over on the table or take it in your hands, then you will notice that its screen will be turned on again so that you do not have to do so manually. The application supports two methods of determining when to turn the screen on or off. The proximity sensor of the phone is used by default, but it does not work well or at all for all phones. If you notice that your phone's screen does not turn off or on again, you may want to switch it to the alternate option in the preferences to see if it works out better for you. The preferences hold several sensitivity settings that you may want to modify as well. 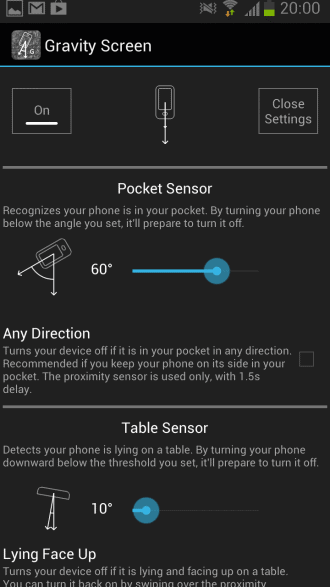 This includes the angle of the table sensor and pocket sensor, which basically determines when the phone is lying on a table or is inside a pocket. Other settings include the sensitivity of turning the screen back on, the timeout for the proximity sensor to save energy, or headphone mode which turns off the screen when headphones are connected when the phone is placed in any way in your pocket. Another interesting feature is the ability to keep your screen active while you are making small motions with your hand to signal to the app that you want the screen to stay on. 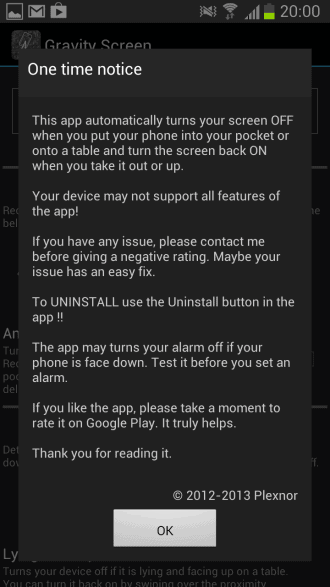 If you tend to forget to turn off your Android phone's screen from time to time then this application is for you. It is also useful if you want to automate the process, or want that your phone's screen turns on back automatically when you take it in your hands. The application is having its toll on your phone's battery life as well, so take that into account when you take it for a test ride. I have already been using it for the past few week or so.. and this app is so liberating! I dont have to touch the power button any more, I just need to shake the phone and it wakes up. You may need to tweak the sensitivity settings sligthly to suit to your usage. This app is for the terminally lazy. Who needs it? FRELWA WROTE: This app is for the terminally lazy. Who needs it? …in part to reduce the number of presses on the power button by half, over the life of the phone, by turning off the screen and locking it every time using the icon which I’ve placed both down in the dock, and up on the notification pulldown shade. But that still leaves all the power button presses that are necessary to turn on the screen whenever it’s needed. Or, in the case of some of the newer Samsungs, like my Note II, there’s an electromechanical HOME key that can also wake-up the screen; but pressing that too many times will eventually wear it out, too. Believe me, it happens more easily than you might think. This Gravity Screen app makes it so that one needn’t touch any of the electromechanical buttons in order to wake-up the screen. In my case, I could turn-off all the features of it which turn off the screen, and only run the one that lets me wake up the screen by shaking, thereby, between the Screen Off & Lock app, and this Gravity Screen app, I’d pretty much never have to touch the power button except for powering on the phone… and I could reduce having to touch the electromechanical HOME key, too, at least for purposes of waking-up the screen. I like that I can just whip out my phone and check my notifications/time and then put it right back. The fluidity and swiftness of the motion is one of those things that you don’t realize how much you like it until you’ve gotten used to it.